I am currently working hard on trying to improve the blog and adding various features that I hope will make your visit here more pleasant. So please tell everyone you know to check me out. This is the sofa I wanted. $2500. Kind of a budget buster. But I was willing to eat water and drink bread for the sake of design. I knew I didnt want to spend that right now...so I went to craigslist. I found this listing. 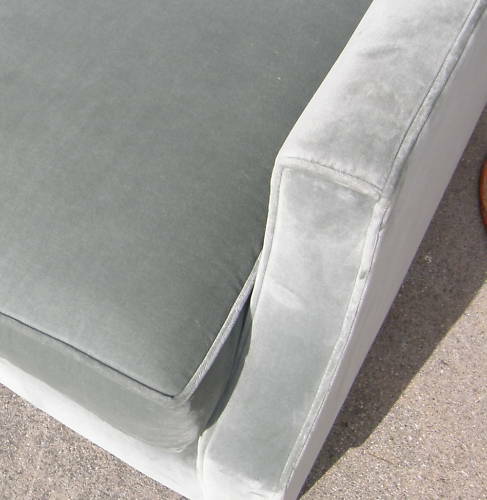 Sofa that is basically untouched- purchased last summer. Comes from smoke free/ pet free home. 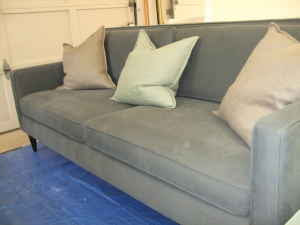 Sofa is Rochelle style with a slate grey/blue brushed cotton fabric that is soft and durable. Comes with arm covers and throw pillow (linen cover with feather insert from Crate and Barrel). About 84" long. Removable wood legs. Comes from a smoke free and pet free home. Contact with any questions / best offer! I thought...BINGO...perfect alternative to the Lucas Sofa. I emailed the seller to get additional pictures. The seller took too long. So I went online and googled it. After not hearing from the seller, I decided on Saturday morning to just look around ebay. As soon as I typed in my keywords. 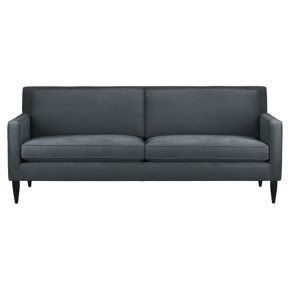 I came across the Martine sofa by Crate and Barrel. I tried to make an offer to the seller. I guess it was too low because the seller did not respond. Thats was ok. Because little did they know I was set out to win this bid. I bidded a little more than what I wanted to, but after not having furniture for two years it was time for me to get exactly what I wanted...or very close. And staying true to thrifting and bargain shopping. I got it much lower than retail. 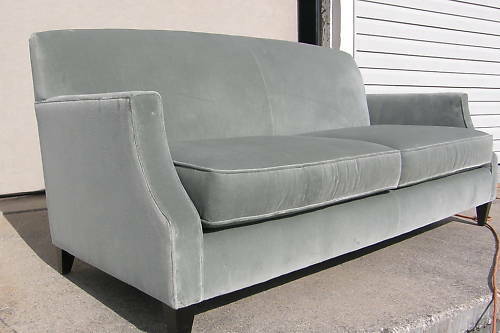 I decided to buy it because I knew that I wanted a grey sofa, but wasnt sure if I bought an inexpensive thrift store piece, how much the upholstery would cost...in total. 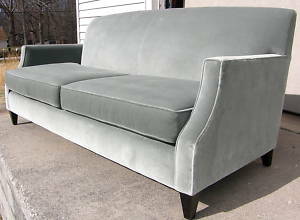 The color on the ebay listing said its a Silver Sage velvet sofa. I hope that'ss code for gray or grayish. 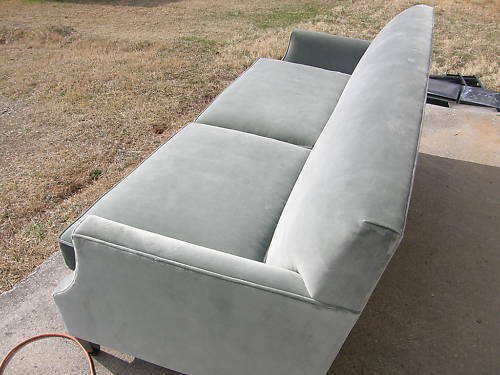 The lines in this sofa are very metropolitan and contemporary. Exactly what I was looking for. Without further preliminaries...heres what I won. So craigslist selling people...YOU SNOOZE YOU LOOZE...well lost to be grammatically correct.